I really love coffee and chocolate (my favourite coffee drink is mocha! (Coffee connoisseurs please don’t condemn me ok?) So when I made this cake, I increased the amount of instant coffee used and instead of using those regular coffee, I used instant Vietnam coffee that my friend got for me during her trip to Vietnam some time ago. I think when the original recipe states Instant Coffee, I think it meant those instant kinds with creamer in them, hence their cakes aren’t as dark as mine. 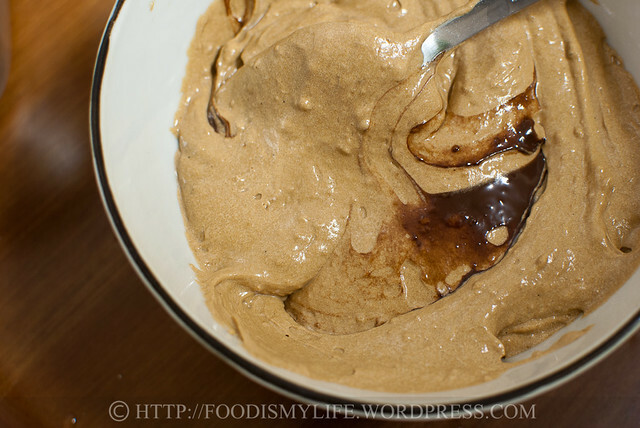 As my Vietnam coffee is just grounded coffee beans with no creamer and sugar, it is richer, stronger and turns the cake batter a really dark brown when mixed in. 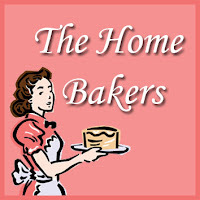 The cake baked and rose very well – emitting an uber strong coffee aroma that got me really excited! The swirl was not very obvious as both the coffee and chocolate batters are very dark in colour – the only disappointment I got in this cake. However, the cake, coupled with the reduction in sugar, tasted extremely rich in coffee with a hint of chocolate – just the way I love my mocha. X commented it tasted like kopi o siew dai (black coffee with less sugar in Cantonese [dialect]), haha. It’s more on the bittersweet side, so if you want a sweeter cake, use either less coffee or increase the amount of sugar (more notes below). 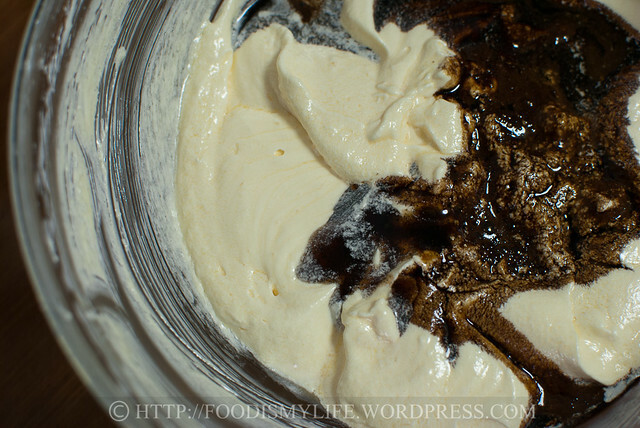 The next time I bake this cake, it’ll definitely be a tri-coloured cake – vanilla batter, coffee and chocolate! Yums! Though I don’t have a good photo of the cake, I still have some decent step-by-step photos to share! And here we go! 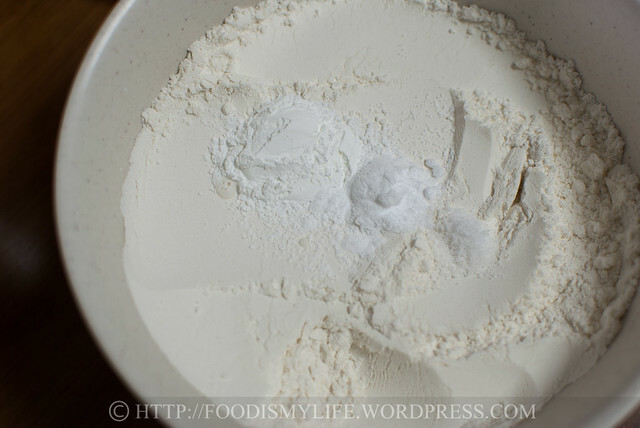 First measure flour, baking powder, baking soda, and salt in a small bowl. Whisk together gently and set aside. 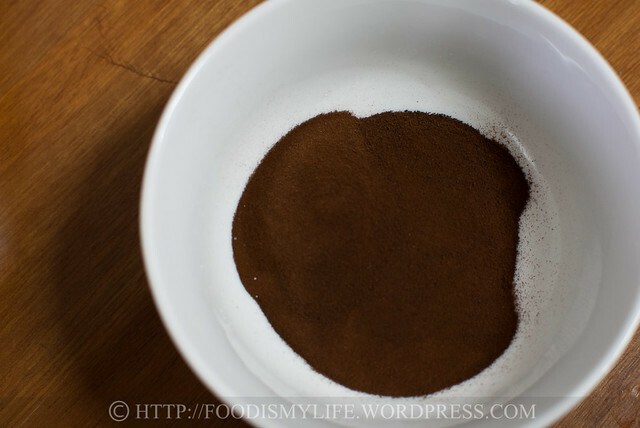 Measure some really good quality instant coffee in a small bowl. Add in some hot water to dissolve the coffee. Set it aside to let it cool. 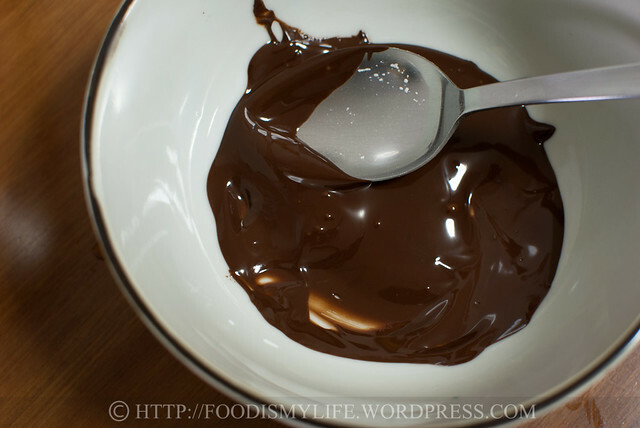 Melt a little chocolate in a medium mixing bowl – I microwaved them on medium power for 30 seconds, then stir until melted and smooth. 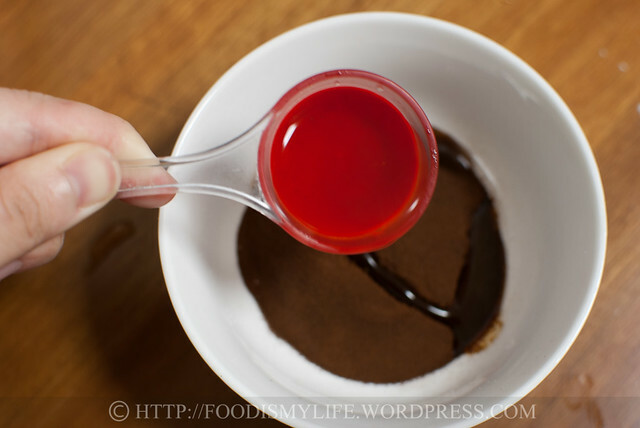 If there are some unmelted bits, microwave again for 10 seconds on medium power, stirring until it has melted completely. Set aside to cool slightly. 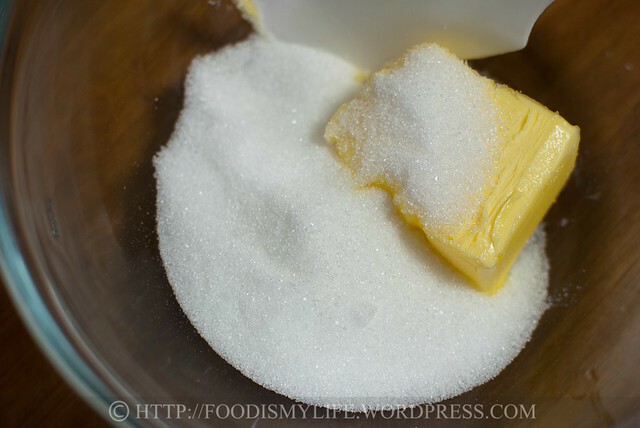 Measure the butter and sugar in a large mixing bowl, then cream until very light and fluffy – this usually takes about 5-7 minutes for me, using a hand-held electric mixer. 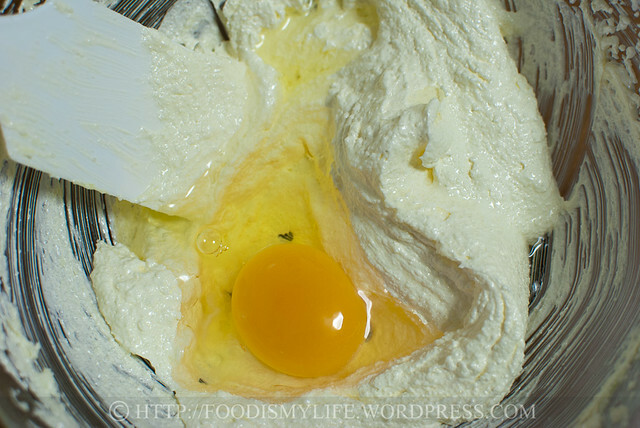 Scrap the sides then beat in one egg for another minute till fully incorporated. Scrap the sides again and beat in the second egg. 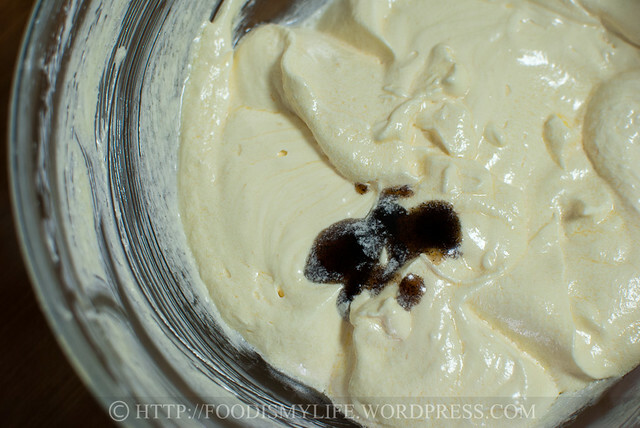 Add in vanilla extract / paste – absolutely loving my newly bought vanilla paste! 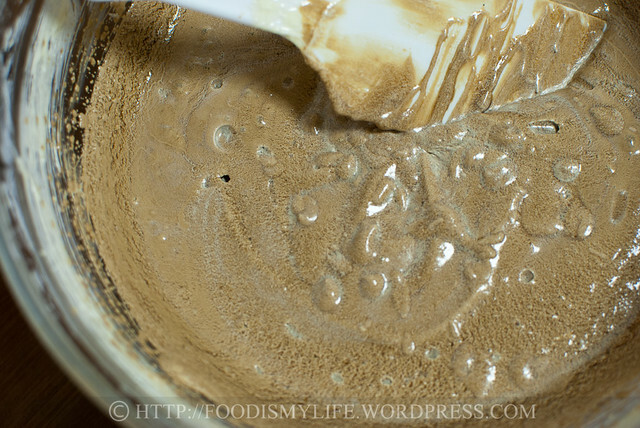 Add in the cooled coffee mixture. 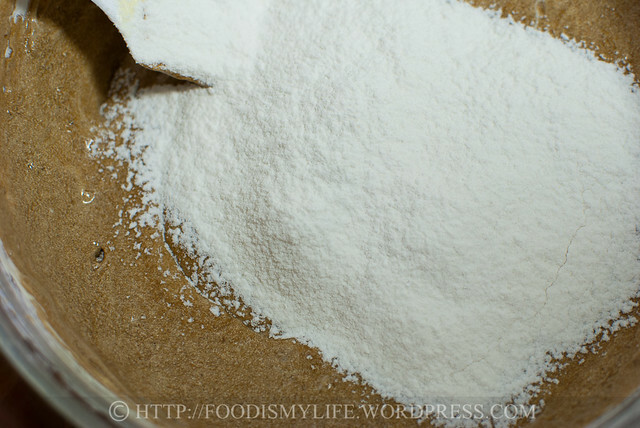 Sift in 1/3 of the flour mixture. 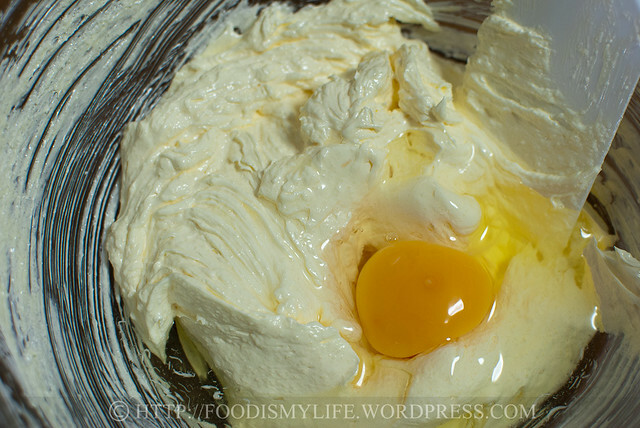 Add in 1/2 of the sour cream and fold it in. 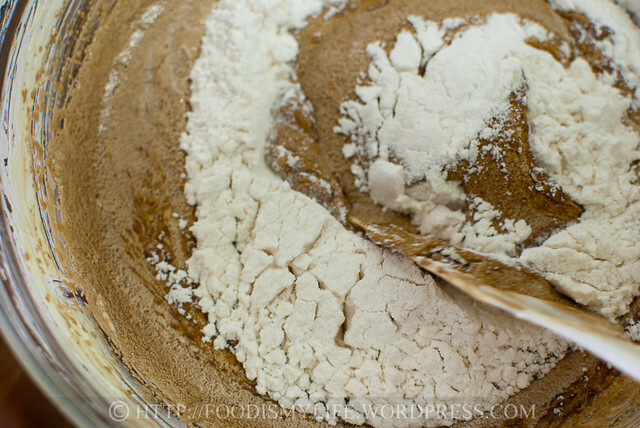 Add in 1/2 of the remaining flour mixture and fold it in. Fold in the remaining sour cream. 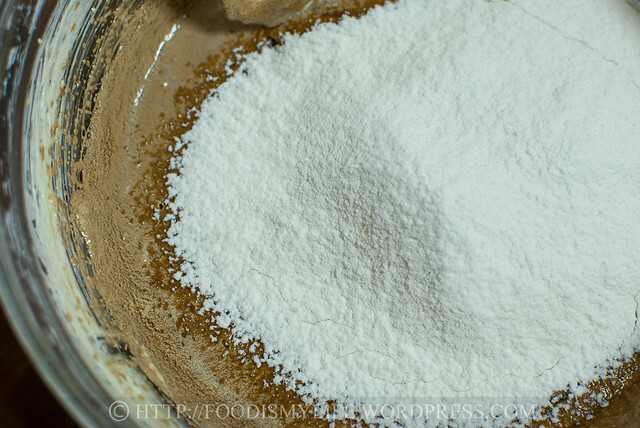 Then fold in the rest of the flour mixture. 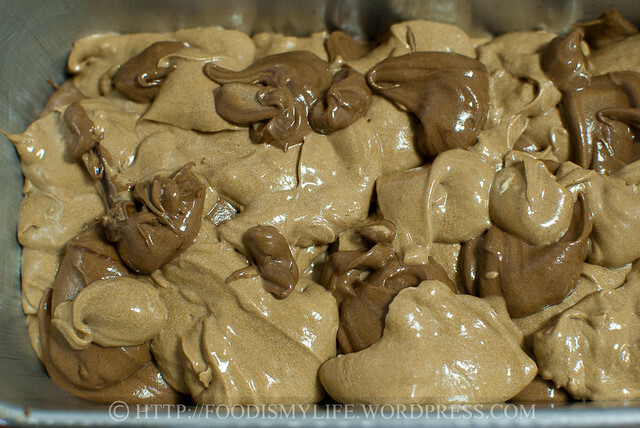 Scoop 1/3 of the batter into the melted chocolate and fold it in. 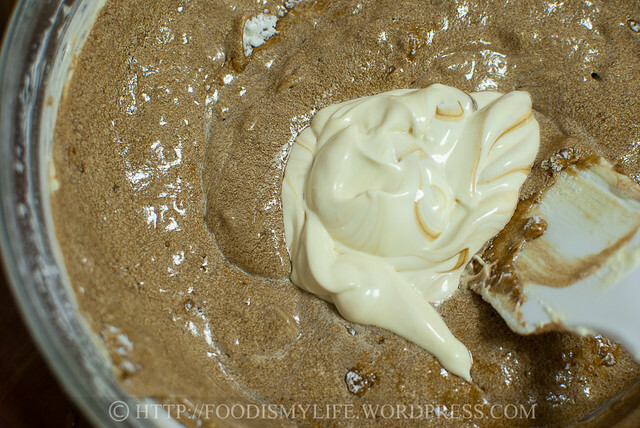 Drop spoonfuls of batter into a greased and bottom-lined loaf tin (mine’s 8×4 inch) – they don’t look good now, but they sure taste good later on! End up something like this! Bake at 175 degrees Celsius for 55 minutes to 1 hour until a skewer inserted into the centre of the cake comes out clean. Tent the top with aluminum foil if you think the top is browning too fast (I tented mine after baking for 40 minutes). I’m going to state the amount of ingredients I’ve used here, for the full instructions and original recipe please visit Lena’s blog. Do hop over here to see other lovely Home Bakers bake on this cake! 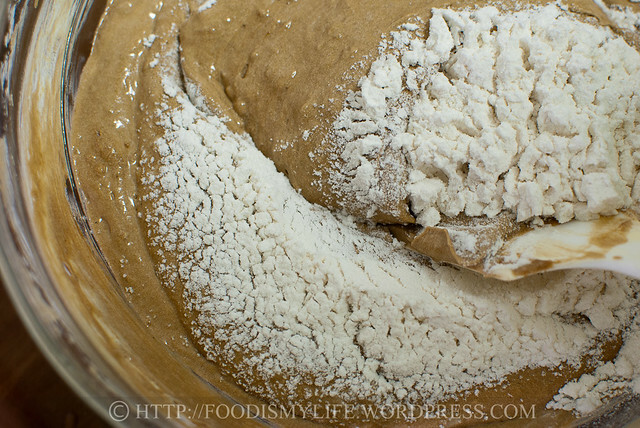 I’m also submitting this recipe to Bake with Bizzy’s Recipe Box! P.S. I rushed this post out within 1 night, so please pardon me if some of my sentences do not make sense! I’m really caught up with work this week, and will only be able to blog more next week, get around replying all your comments and visiting your blogs! Thank you so much for stopping by! 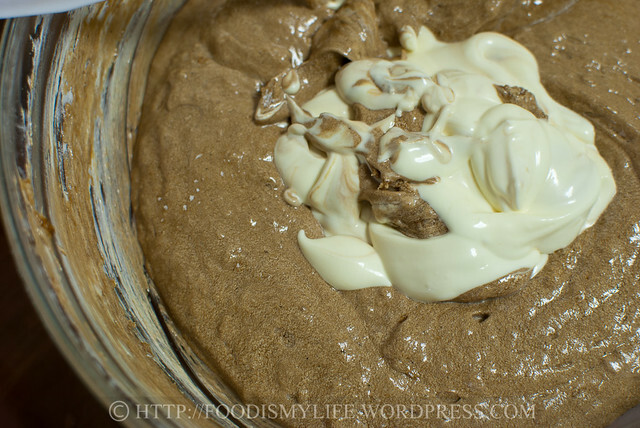 Once again, please visit Lena’s blog for the full instructions for this recipe! the cake sounds good..I like it when you say that its bittersweet and not overly sweet. looks like a perfect tea time treat! Hi Zoe! I love sour cream in cakes as they make the cakes richer and tastier, but it’s a bit expensive to keep using it here in Singapore… Sorry to hear about your cake, hope the next bake will be better for you! I have tried Vietnam coffee before and this cake looks enriched with lots of coffee flavours. I realised everyone else except for me and you use sour cream in our cake batter but you had decreased your butter from 1 stick to 3/4 and increased the amount of egg from 1 to 2… I was following the recipe as I could but the cake texture is not the kind that I’m after 🙁 I should have modify the recipe more… LOL! Thank you for the compliments Uru! Glad you like the photos! Thank you! 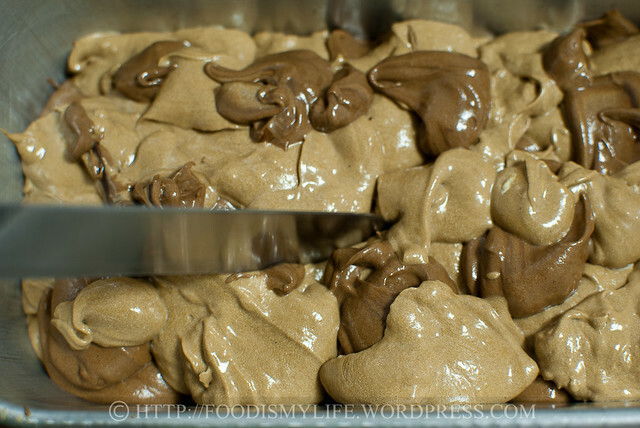 Yea I wonder why the contrast didn’t turn out very well… Mmm I haven’t tried freezing them… they were gone all too soon! 😉 Will definitely check out Honey Cake… it’s already got me curious! Thanks Smidge 🙂 Yes I was really surprise by how intense the Vietnamese coffee turned out! Your cake looks wonderful! Swirl or no swirl, as long as they are super delicious! Five days? We finished it by the third day! 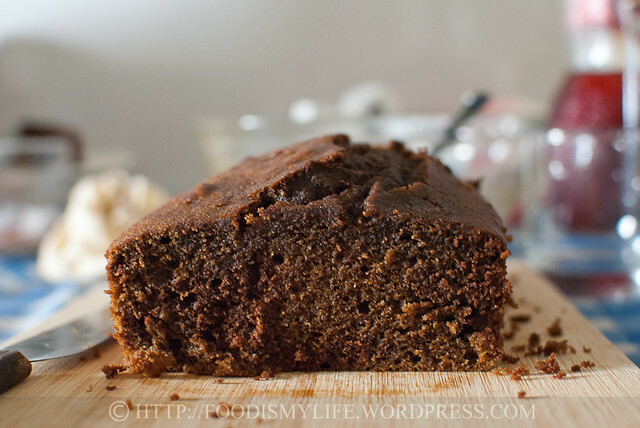 I can see myself baking this again, yum! Have a great week! Hi Jasline, your coffee cake looks so moist and rich. I can imagine the aroma of the Vietnam coffee, which I understand is very aromatic and strong. that’s a gorgeous loaf despite the swirls are not very obvious. I have an impression that you have a very rich coffee flavoured cake here! YUm! 5 days? dont think it will stay there for that long! Hey Jasline. 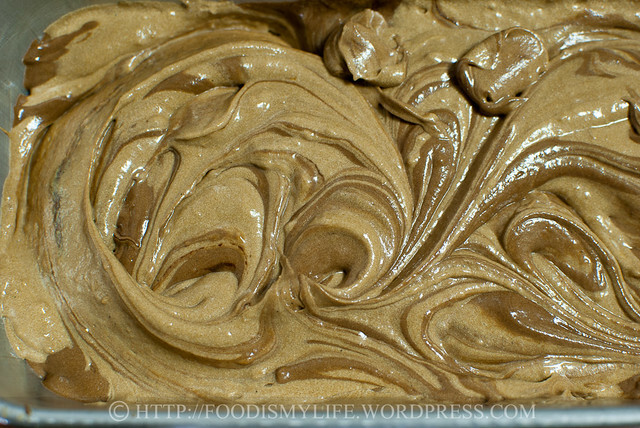 It still looks really gorgeous and I can see the rich mocha flavour in that batter and swirl before you baked it. 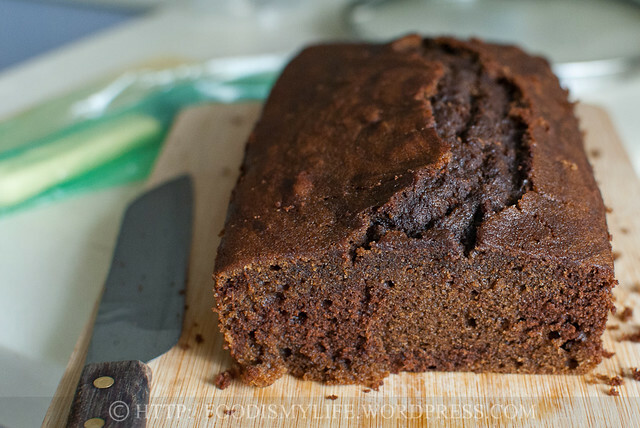 Seriously, I love to drink mocha’s so this cake certainly looks fantastic to me! This looks like a delicious cake! Vietnamese coffee? 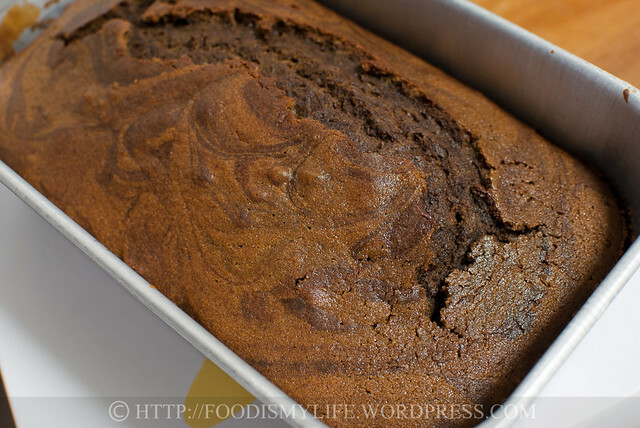 This is one cake loaf that must be tried! It looks simply gorgeous! Even though I live alone, the only way this cake would last 5 days is if I were on vacation for the first 4. It sounds and looks delicious! 5 days? That’s hilarious Jasline… I give it maximum 2. It looks amazing and I love marble cakes! The last coffee cake I baked was an Ukrainian Honey Cake (Medivnyk) as I’m not a big cake fan with the layers of frosting etc. but I like things I can freeze and then defrost for eating later. It also used sour cream as well as lots of lovely honey.